The Grading Grid brings together two pork value factors, dressed Carcass Weight and Estimated Percent Lean Yield, into the form of a grading grid. The highest grade indexes within the grid have been established where the plant feels there is best carcass value and pig meat yield. 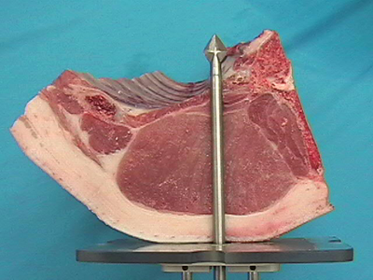 The intersection of the dressed carcass weight and the calculated "Estimated Percent Lean Yield" within the grid establishes the grade index for a pork carcass. Yield (Estimated Percent Lean Yield) is governed by a mathematical formula that is based on extensive carcass cutouts. 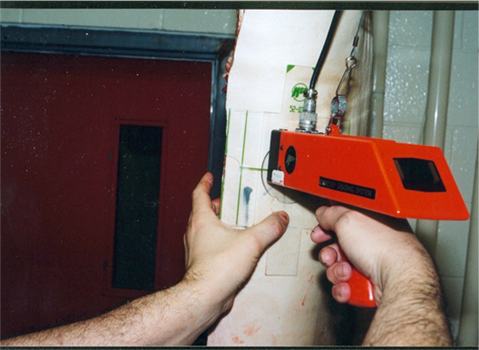 The equation has two variables, fat thickness and lean depth measured by the Destron Electronic Probe. Fat is the most influential factor of the two used to determine “Estimated Percent Lean Yield”. Fat measurements from the Destron probe accounts for over 90% of the variation in the lean yield percentage calculation while the lean measurement only provides a small modifying influence, in the formula. Generally, the lower the fat measurement the higher the “Estimated Lean Yield Percentage”. 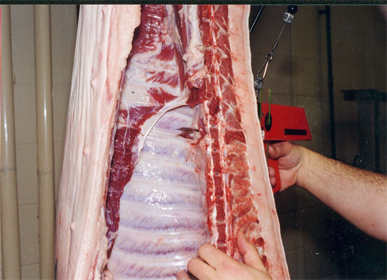 The Electronic probe is inserted through the skin on the left side of the carcass at a point 7cm lateral to the center of the spine between the 3rd and 4th last ribs (Figure 11a & 11b). The probe must travel through the loin muscle of the carcass and emerge 2cm lateral to the junction of the ribs and the lateral spinal process (Figure 13). The probe has passed through the deepest part of the loin (Figure 12). 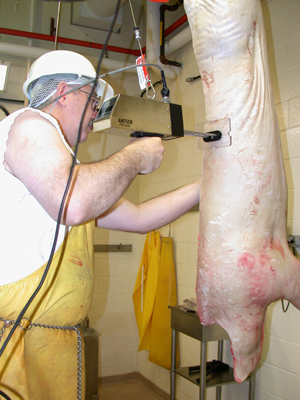 During the grading process, all fat and lean measurements are registered and stored electronically into a computer data base as the probe is withdrawn from the carcass. Target the preferred dressed carcass weight range. Target the preferred estimated lean yield by controlling fat at the market weight.